The Uk’s oldest dance company, Rambert was founded by Marie Rambert in 1926 and is famous the world over for pioneering choreography and performance. Dame Marie Rambert (1888-1982) became involved with the famous Ballets Russes and assisted the talented Vaslav Nijinsky in his choreography of The Rite of Spring which rocked the cultural boat when it was first performed with Stravinsky’s composition in 1913. Rambert Dance Company performances have not led to any near riots, but pushing creative boundaries continues to be part of their remit. Behind great artistic innovation lies the nuts and bolts in the physical environment that houses such creation and the contemporary dance company, Rambert have been preparing to move into their new headquarters in London’s South Bank. The South Bank is an eclectic cultural area renowned for its theatres and exhibition spaces. Rambert’s new, purpose built home will be a welcome addition to this thriving hub and will incorporate a choreography centre, a centre for dance music (since the company always tours with an orchestra) and space to display the Rambert archive. 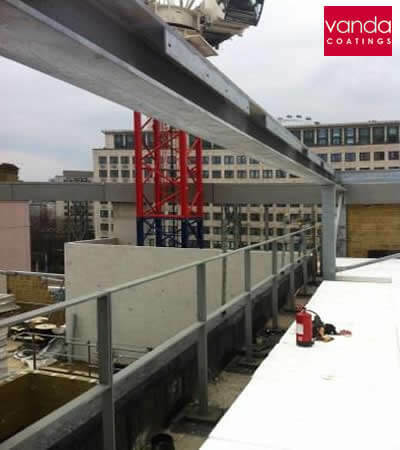 Vanda Coatings were approached by a contractor to see if we could coat the structural steel on the top of the roof and with extensive experience on similar projects, we didn’t hesitate in accepting. This top floor will become a plant room which will house the lift mechanism, air conditioning units and electrical items. These mechanisms are crucial to the smooth operation of a modern building serving a multitude of purposes and it is essential such work is carried out to a high standard with particular attention paid to health and safety whilst working at a great height. The work was completed by Vanda Coatings in one day.